Vivo released the Y95 few days ago in the Philippines, yet another mid-range smartphone from Vivo called the Y91 announced today here in our country. 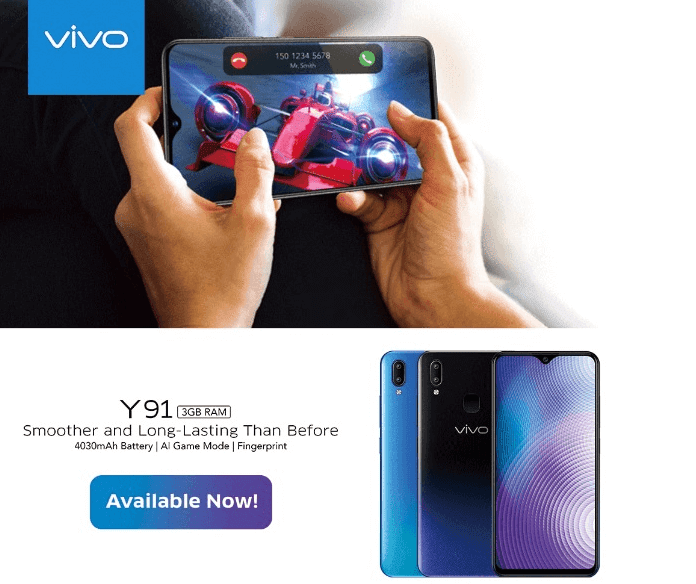 The Vivo Y91 considered as an affordable alternative to the recently released Y95. The handset packs a notched display with dual rear cameras, AI Face Beauty mode, and a 4030mAh battery on board. The Vivo Y91 is the more affordable variant of the Y95. The mid-range smartphone features a back design with gradient colors, 6.22-inch halo full screen design, Snapdragon 439 SoC, 4,030mAh of battery, and a 13MP + 2MP dual-camera setup at the back. The Vivo Y91 is almost identical with the Y95, they have a similar design, from the body, display, and positions of cameras and button. The RAM and ROM are 3GB and 32GB respectively, which is a downgrade from Y95's 4GB and 64GB combination. The Vivo Y91 is a tone down version of the Vivo Y95. For selfies, the front camera is now 8MP as compare to 20MP of its brother. The Vivo Y91 boots with Android 8.1 Oreo OS with Funtouch OS 4.5 skin. It also has Jovi AI with AI game mode for uninterrupted gaming. The handset is now available in Vivo stores and retail partners nationwide as well as in Shopee and Lazada for Php9,999, that is about 4000 pesos more affordable than the Y95.